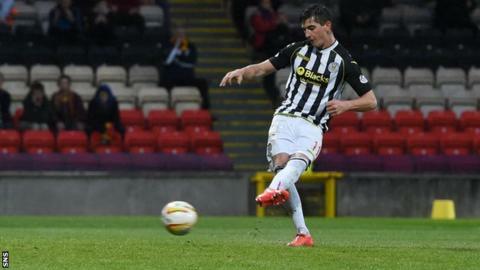 St Mirren midfielder Kenny Mclean will wait until the end of the season before deciding where he will play his football next term. The Scotland Under-21 international is soon to be out of contract and has been linked with Rangers. McLean, 22, came through the youth system at the Buddies. "I've not thought about it too much but it keeps coming up in conversation everywhere around the place," he told BBC Scotland. Apart from a loan spell with Arbroath in 2010, McLean has played all his senior football with the Paisley club, who currently find themselves in a five-team battle to avoid finishing second bottom in the Premiership and entering a relegation play-off. "I'm just focussing on the pitch - we've got three massive games coming up with the club to ensure its Premiership safety after that we'll sit down and talk about where I'll be playing my football in the next few years," added the midfielder. Meanwhile, St Mirren manager Danny Lennon says the Buddies will have to keep their emotions in check for the end of season run- in starting with Saturday's match against Ross County. Lennon was given a suspended ban for his part in a touchline spat with County manager Derek Adams in their last meeting. "When you get a bit emotional you sometimes forget to play football and Derek and I did have a wee spat the last time we played when we said things to one another that we regretted," Lennon explained. "We apologised after the game and they were sincere apologies. I have tremendous respect for Derek and what he achieved at Ross County."